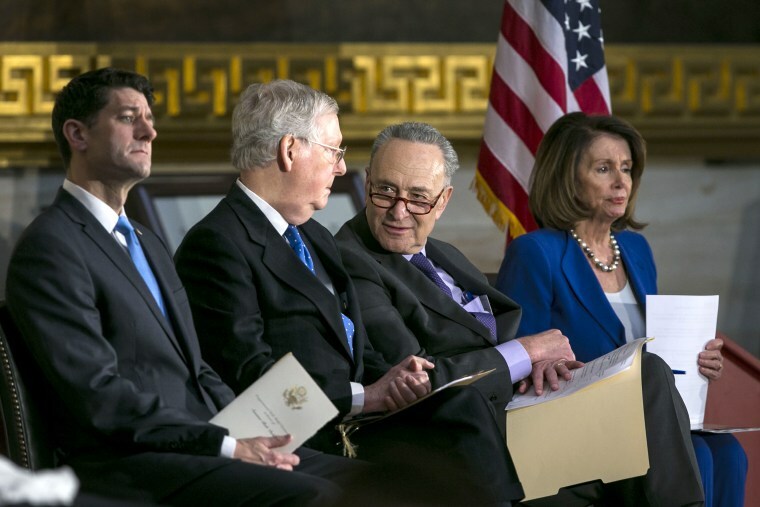 WASHINGTON — Negotiations on a massive spending package to fund the government have slowed in recent days as a congressional-imposed deadline of March 23 looms. House and Senate negotiators from both parties, working with the White House, had hoped to unveil the details of the $1.3 trillion bill by now to allow time to move it through both houses of Congress ahead of the deadline, but a significant number of policy disagreements over the all-encompassing measure have delayed it. Issues include border security, women’s health, the environment, campaign finance and even a major transportation project in New York and New Jersey called the Gateway Project. If Congress misses the deadline, they’d have to pass the sixth short-term funding bill this fiscal year, a move that would not only anger the Defense Department, which complains that incremental budgeting is bad for national security, but give further credence to those who say Congress is unable to do its job. Senate and House leaders have been working for five weeks on the details of the appropriations bill. Congress has been funding the government in short spurts since October, and couldn't stop a three-day government shutdown in January. But an agreement in February broke a monthslong stalemate and set the parameters to write a funding bill for the final six months of the fiscal year. The comprehensive spending bill, known as an omnibus, includes funding for every corner of the government, from entitlements to overseas wars, education and farm subsidies. Omnibus bills are often filled with measures known as policy riders — specific carve outs of policy that often have little to do with funding the government but involve a specific, and usually partisan, issue. House and Senate negotiators of both parties are in the final and most difficult stage of negotiations, working out the terms even as most Republicans in the House — and many in the Senate — are expected to vote against it, leaving the bill’s eventual passage mostly to Democrats. Rep. Mark Walker, R-N.C., said that he hopes the final bill includes items he supports, including additional protections for health care workers against contributing to abortion procedures. But he said that won’t be enough to persuade him to vote for a bill that is expected to increase domestic and defense funding by nearly $400 billion over the next two years. “I don’t know if you can put enough good with enough poison to make it good enough to get to the place to vote for it,” said Walker, chairman of the House GOP's 170-member Republican Study Committee. One issue holding up a final deal is funding for a rail project connecting New York and New Jersey. The Gateway Project, which was approved by then-New Jersey Gov. Chris Christie, New York Gov. Andrew Cuomo and the Obama administration in 2015, has been an important priority for Senate Majority Leader Chuck Schumer, D-N.Y. But President Donald Trump has threatened to oppose it, perhaps to extract concessions from Schumer on other issues. Rep. Peter King, R-N.Y., said he’d vote against the omnibus if the project isn’t funded. He said he emphasized that to the president in a phone call Thursday. “I think I said all I had to say today and it went very well. He was listening, he took it all in,” King said. Another issue of contention is border security. There is disagreement between the two parties on the size of the immigration and border patrol force, and how much money to spend on the president’s desired border wall. The White House floated adding a short-term extension for the Deferred Action for Childhood Arrivals program, or DACA, to the omnibus on Thursday, but that idea quickly fell flat when neither Democrats nor conservative Republicans would support the idea. The bill is now expected to be released to the public, and to lawmakers, Sunday or Monday, giving members just a few days to read a measure that is expected to be more than a thousand pages long.